An original, local Christmas card designed and inked by Dorothy Sturgis Harding. 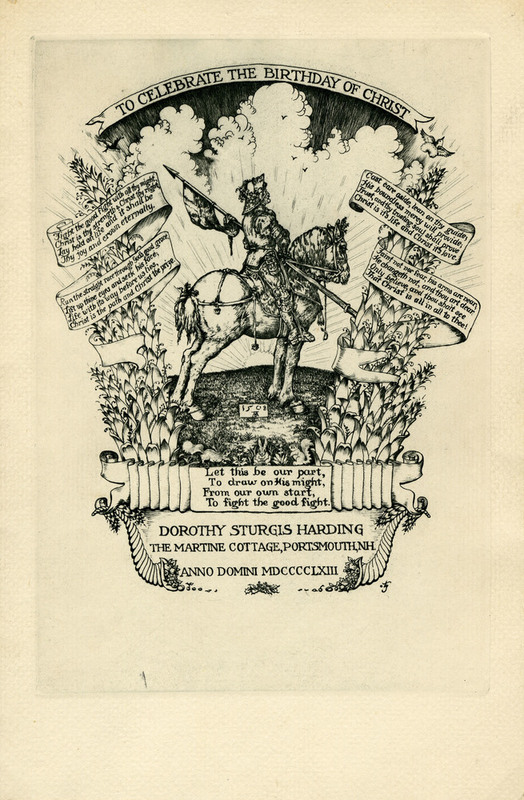 Features a knight in armor on mount, flanked by florals with a banner at top with title text. Biblical verses on small banners at sides and bottom, with artist name and address below. Interior blank. ~ Dorothy Sturgis Harding , “"To Celebrate the Birthday of Christ",” Portsmouth Public Library's Online Archives, accessed April 23, 2019, http://portsmouthexhibits.org/items/show/2083.